As promised, today we are formally releasing LogBook, our internally developed tool for logging events from Flex (and coming very soon, pure Flash AS2/AS3) applications. For the uninitiated, logging is the process of recording and storing information about events in your application. The functionality is similar to the trace command, but a lot more robust. Logging combined with a strong log viewer like LogBook gives you a much deeper understanding of the state of your application. 1) LogBook is being released under the MIT open source license. 2) A detailed post on its features and how to use it is here at the CIM Flash Team Blog. 3) The code for LogBook is being hosted at http://cimlogbook.googlecode.com/. 4) We have also set up a Google group for logbook that we can use to discuss features that we should add in upcoming releases and bugfixes/patches. 5) The installer can be found in the downloads section there. 6) LogBook runs on the AIR beta 3 runtime. At CIM we already have a list of features we are going to release in the next build. But of course if you have any feature you would like to request, please drop us a mail at cimlogbook@googlegroups.com. 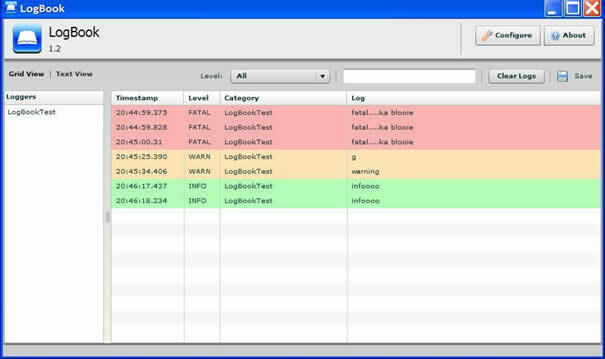 We are really hoping LogBook 1.2 is the first step towards a robust Flex/Flash development/debugging toolset. Pingback: Released: LogBook, An Open Source AIR based Flex Logging Application - Affordable Web Developer - Just another WordPress weblog on Affordable open source web development. Next Next post: Flex optimization tip: ArrayCollection.removeAll() vs. ArrayCollection.source = new Array(). Is this a bug ?